Rumpole is determined to win the appeal of that ghastly terrorist who is now safely in Belmarsh Prison. This is absolutely the right place for Dr Mahmood Khan, if you want my opinion, or that of most sensible people, but when I tell Rumpole this he starts talking about Magna Carta and the Bill of Rights. And he hardly listens when I tell him that there were no suicide bombers and no al Qaeda when King John signed up to the charter on the island of Runnymede. John Mortimer’s Rumpole of the Bailey has become an enduring fictional creation. Leo McKern’s performance as the character on television immortalised him and the phrase ‘She Who Must Be Obeyed’ is possibly more famous than the Rumpole himself. I remember watching the show when I was a kid and being fascinated not by the witty badinage, or plot twists, but by the wigs! Oh those wigs, I always wanted one. Rumpole’s own wig has lost its lustre and has developed an unsightly yellowish tincture, to match his raggedy robes. He’s a man out of time it seems, coasting on successes that no one remembers, refusing to use a computer in court (pen and paper are faster he maintains) and reduced to relying on the dreadful Timson family for cases, as getting caught committing petty crimes is something of a tradition for them. Things take a turn for the decidedly worse, however, when Rumpole agrees to defend a doctor from Pakistan who has been accused of crimes under the new anti-terrorism laws drawn up by the New Labour government. Under the terms of the legislation the defendant and their counsel are forbidden from learning what the particulars of the arrest are, such as what the crime in question was, when it occurred, what evidence has been presented. The days of ‘innocent until proven guilty’, have come and gone it seems, with pressure mounting on Rumpole to drop the case from above and below. A New Labour stooge attempts bribery and the Timsons withdraw their business. Rumpole himself begins to doubt his client’s innocence. Dr Khan’s seems almost too good to be true, waxing lyrical about cricket and the Queen, all the while wearing a patient, bemused expression on his face while sitting in Belmarsh prison. Is it all an act? What’s more She Who Must Be Obeyed, Hilda, receives an unusual proposition from Rumpole’s enemy Justice Leonard Bullingham, whom he nicknames Mad Bull, all of which she details exhaustively in her own memoirs! Could Rumpole’s lady wife be looking to sweep the carpet from under him? 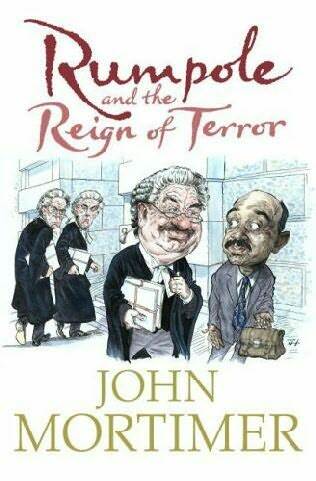 Rumpole and the Reign of Terror is a quick read, with amusing asides from our hero to the reader. As far as I know She Who Must Be Obeyed was previously an invisible presence in the books, at least that was my impression from the television show as a kid. Mortimer introduces extracts from her own memoirs as a counterpoint to Rumpole’s struggles with the Dr Khan case. Much of the humour derives from witty quips traded between the long suffering couple and the courting of Hilda by Mr Justice Mad Bull makes for a diverting secondary plot. However, at its heart this book is an angry broadside against the policies of New Labour, its shirking of the letter of the law and dismantling of civil liberties. Rumpole finds himself stuck in a situation Kafkaesque in its absurdity, attempting to defend a man stripped of any right to a fair trial. Any appeal on our hero’s part to the rights of a citizen of Britain is dismissed as unfashionable and behind the times. Rumpole himself is treated as a relic of a by-gone age. That Mortimer ties this all together in a gripping, yet also witty package is a testament to his skills as a writer. This is my first taste of the Rumpole series and I’ll be happy to investigate further.